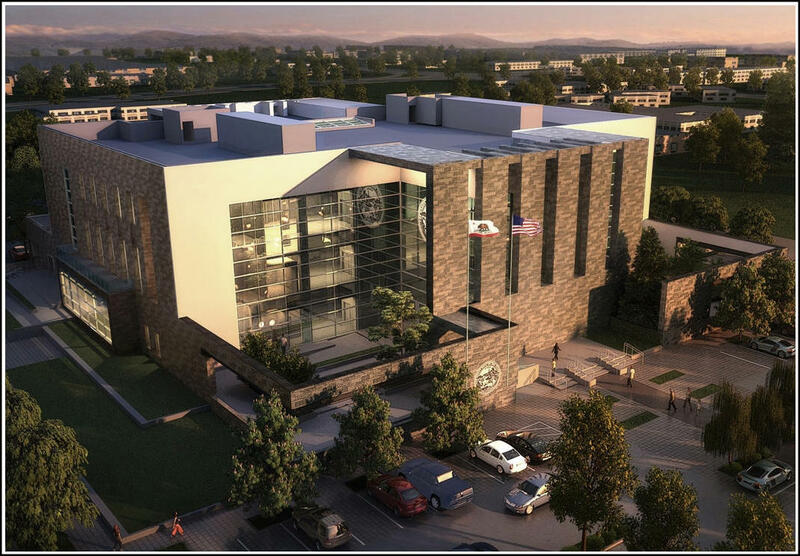 SAN FRANCISCO—The State Public Works Board (SPWB) today approved preliminary plans for the new Yuba City Courthouse. The new facility, to be located at 1077 Civic Center Boulevard (map), at the intersection with Veterans Memorial Circle, will consolidate court operations from three facilities — the historic courthouse (Courthouse West), the Annex or Courthouse East, and the leased Family Law Court. The new three-story building will house seven courtrooms in 78,700 square feet. The architecture, by RossDrulisCusenbery Architecture, features an innovative “four courtyards” design scheme. The contemporary design is intended to both reflect historic precedents in local civic buildings and revitalize an evolving government center in downtown Yuba City. The cross-shaped building will present a formal façade in all four directions, with landscaped courtyards in each corner of the block. The building layout emphasizes openness and accessibility, with public spaces and waiting areas situated to take advantage of courtyard views as well as views of the Sutter Buttes to the northwest. The building is being designed with sustainability in mind, and is expected to eligible for a LEED Silver rating by the U.S. Green Building Council. Sustainability features include ample use of natural light, use of landscaping to reduce ambient temperatures inside the building, careful choice of building materials, practices to minimize construction waste, and energy-efficiency measures such as high efficiency mechanical systems and sophisticated building automation and control systems. SPWB approval marks completion of the preliminary plans phase and enables the project to move into working drawings, which is the final phase of architectural design. Construction is scheduled to begin in mid-2013, but before that, local outreach will be performed to ensure that local subcontractors and suppliers have the opportunity to participate in prequalification and bidding. Construction is scheduled to be completed in late 2014. The $74 million project, managed by the Administrative Office of the Courts, is funded by Senate Bill 1407, passed in 2008, which finances critically needed courthouse construction, renovation, and repair through a portion of judicial branch fees, penalties, and assessments, without impact on the state’s General Fund. The state Budget Act for fiscal year 2011–2012 contains significant cuts to the account that funds SB 1407 projects. These cuts may cause delays in SB 1407 projects and project budget reductions, but are not expected to delay this project’s progress in the current fiscal year.